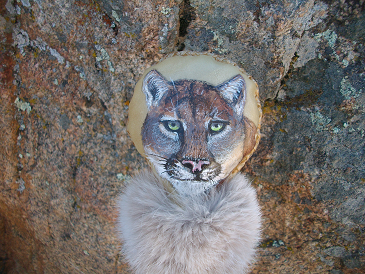 By the artist "Moon Cat", the Mountain Lion Rattle embodies the energy and medicine of the Mountain Lion. The Mountain Lion teaches us patience, awareness, stamina and the ability to pounce! 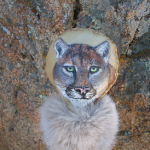 When we work with the Mountain Lion Medicine we will awaken to an inner knowing of awareness and courage. Courage to open and receive support that enables our dreams to come true. This Rattle is made from rawhide and contains organic corn, selenite and clear quartz crystal within it. It also has a mountain hand carved and painted on the handle, along with rabbit fur on the top of the handle.